Hashimoto’s can be seriously debilitating. Some feel like they are doing everything they can do in order to lose weight or to gain vitality, though nothing is working and they continue to feel sluggish, tired, unmotivated and uncomfortable in their skin. Hashimoto’s is an autoimmune disease, where your immune system attacks the thyroid gland and impairs the normal production of thyroid hormones. However, did you know just one little exposure to gluten, even once every 6 months may reduce your chances of getting well even if you’re doing everything else right? Consuming gluten is one of the biggest causes of autoimmune diseases. In fact, gluten has been linked to over 50 or more autoimmune diseases; therefore it is crucial to eliminate gluten in most circumstances if you have or do not want to get an autoimmune disease. How do you know if you have Hashimoto’s? If you are experiencing some of the above symptoms, then it is worthwhile seeking further testing. 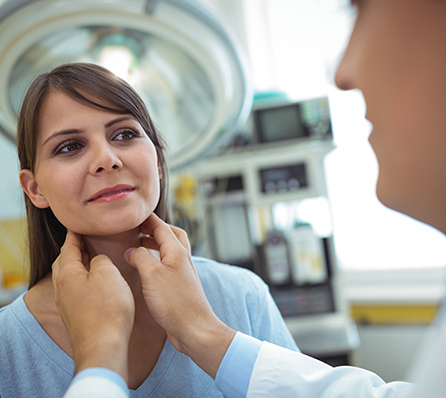 To confirm whether you have a thyroid problem, you must organise a full thyroid analysis with your preferred practitioner. The following tests are recommended: thyroid stimulating hormone (TSH), Free T4, Free T3, Reverse T3, Peroxidase Antibodies, Thyroglobulin Antibodies, Ferritin, Vitamin D3, Selenium, zinc, magnesium and vitamin A.
I have included nutrient tests because if there is a thyroid problem detected, then balancing these nutrients can certainly assist in reducing your symptoms. Intestinal permeability has been proven to be a huge contribution towards the diagnosis of an autoimmune disease. We know that gluten directly causes intestinal permeability which is discussed in depth in this previous blog post – it is evident that gluten must be eliminated from the diet to reduce symptoms of Hashimoto’s and all other autoimmune diseases. The consumption of inflammatory foods according to the individual (eg eggs, dairy, nuts). For a full list of inflammatory foods and inflammatory fighting foods click here and here. Foods high in omega 3’s including Inca Inchi Oil, fatty fish and hemp seed oil. Don’t forget your lifestyle! Sleep, movement, sunshine and connecting with nature is just as crucial as the elimination of gluten and fixing nutrient deficiencies. Make all these elements your priority! To begin your journey to improve thyroid health or to lessen your chances of getting an autoimmune disease, it is imperative that you remove all gluten from your diet. Once this is achieved, focus on other elements that will support your thyroid health. When you regain your thyroid health, you will experience more clarity, energy, weight loss, more vibrant skin and stronger hair. It is worth it! What have you done to improve your thyroid health? Have you eliminated gluten completely and experienced benefits? We would love to hear from you. I have been gluten free since 30 Jan this year, I have hashimotos, endometriosis, Diverticulitis and osteoporosis. I am eating paleo with some seeds, grass fed butter and raw milk. I also eat some fermented food every day. I have probably had 7 glasses is alcohol in that time. My weight has gone from 67 kgs to 63.5 kgs. Hi Mary, thank you for sharing your journey. Well done with how far you have come! The poor sleep and lack of energy may be due to many things – adrenal issues, nutrient deficiencies, gut dysbiosis and so on. It may be time to get some support from a holistic practitioner. All the best and I hope things clear even more for you soon! I have some auto-immune issues, possibly Hashimotos, and would like to take supplements to increase my immune system for other reasons. Should I increase my immune system if I am already auto-immune? Marjorie, if you boost your immune system, you boost the attack on the thyroid. Best to leave it be to do its thing. You can support it, but i don’t recommend boosting. Hope this makes sense! I was diagnosed with Hashimotos 35 years ago at the time of a hormonal change when I quite nursing my baby. My symptom was hyperthyroid. After 10 years on synthroid, I have never had any other symptoms even though I still test with Hasimotos. Why does everything I read talk about hypothyroid and rarely mention hyperthyroid? I have been gluten free now for years but still don’t notice a different either way. I do, however, plan to remain gluten-free just to play it safe. Hi Beth, yes, I completely agree that there needs to be more talk on Hyperthyroidism so we will take this into account and consider writing about it in the next few months! Yes, great, stay GF as it is likely helping the halt of the disease progressing further. All the best! Where is the link for other inflammatory foods please. Thanks for a great article. Been thyroid issues for over 5 years but only diagnosed as Hashimotos March this year – think menopause through all my hormones further out of whack making me very foggy brained, fatigued, terrible mood swings, more than normal stomach issues etc. a change to a great dr – same Thyroxine but addition of iodine, LDN, troche for hormones, multiple supplements, GF diet (I was mostly wheat free due to sensitivity) & then DF too has seen huge changes. Hair growing back, more energy (but not what it used to be), moods more even and feeling more myself again. I highly recommend you seek help and tests as suggested above not just the TSH as many Drs will do. Keep seeking a good dr till you get answers – contact a compounding pharmacy to get names of Drs can help too. Hello! I enjoyed your article, I was diagnosed with Hashimotos 8 years ago when I began to have hive issues. I had a high antibody count & a nodule on my thyroid. 4 years ago I had to have my thyroid removed as the nodule was found to be cancerous (I now take Armour). I mostly avoid gluten but do slip here & there. My question is now that I have no thyroid, how does hashimotos affect me? I am still having hive issues. Thank you! Some years ago an endocrinologist recommended I try gluten free for my Hashimotos. She said a colleague of hers says it’s worth a try even tho there is no scientific evidence to back it up. So for two years I went gluten free, some slip ups now and again. Yet my doc was surprised and happy as she said it reduced my antibodies from 15,500 to 271 in 2 years and she told me to continue. I didn’t realise however that any little bit of gluten will put u back so far…. 95% of the time I’m gluten free tho now and then when staying with people I don’t fuss.